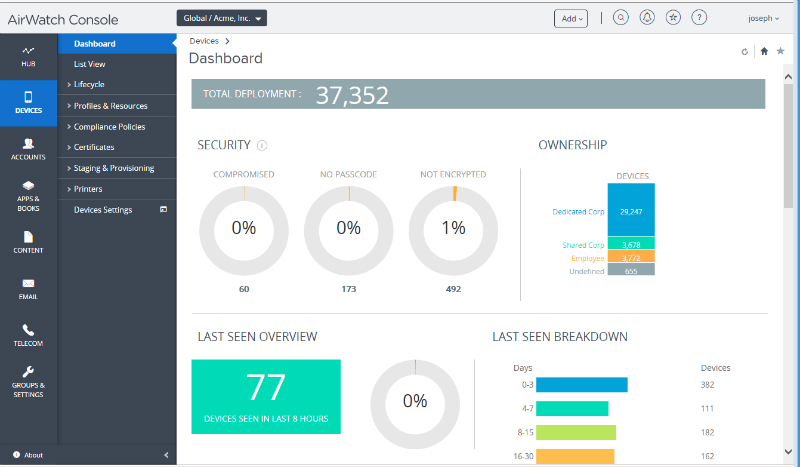 AirWatch MDM is a device lifecycle management solution that provide users the ability to configure, manage, and support mobile devices both in-house and remotely. Companies can significantly lessen waiting time for configuration as the software is fitted with an onboarding module and quick configuration settings. Its easy-to-use architecture affords users to do that and support bulk provisioning programs as well. Device owners and managers can also rest assured in times of emergency. AirWatch allows your IT personnel to remotely deploy services to deal with such complications. Troubleshooting can now be done quickly and the business can go on with their operations using their devices with minimal interruptions. Users can quickly configure settings in their devices. This is afforded to them by AirWatch’s own architecture. Now, one can customize settings using simple procedures on a user-friendly interface. No one will need to consult IT personnel busy with other things to perform initial device configurations. In today’s age, businesses deem it necessary to change the software to keep up with the latest technologies. With AirWatch, this is no longer a requirement. The software automatically updates and provide users with same-day support. Furthermore, the software is updated regularly to help its customers keep up with others in the marketplace. AirWatch sports a scalable system with its open architecture. This accommodates the potential of businesses to grow beyond their present scale. Multifaceted expansions are supported by the software such that when companies progress, their system also moves with them. With AirWatch’s open ecosystem, it can support the existing framework or any enterprise. It can be integrated seamlessly with many kinds of software via its different types of integrations. Now, companies need not overhaul its framework when they want to adopt AirWatch for other benefits.